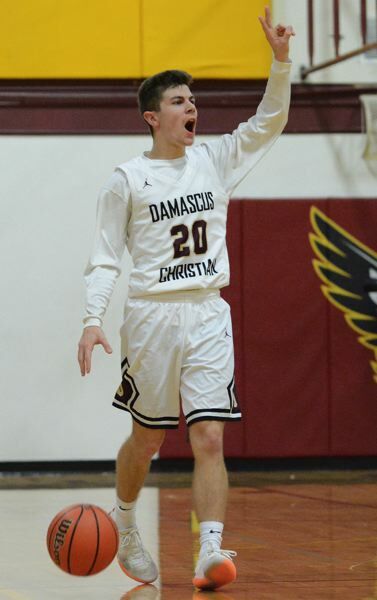 Damascus Christian avenged an early-season loss to claim the fourth-place game Saturday morning at the 1A boys basketball state tournament 59-52 over Sherman, which entered the playoffs ranked No. 1 among the state's small schools. "We knew if we were going to compete, we would have to play really well," Damascus Christian coach Brad Patrick said. "It was close the whole way outside of the last couple minutes." The teams traded the lead nine times before the Eagles went in front to stay on a Jacob Zakharyuk layup with 4:49 to play. Sam Titchenal knocked down a 3-pointer on the next trip, and Spencer Powers followed with a layup to build the margin to six in a flash. Damascus went 5-for-6 (.833) at the free-throw line in the final minute to seal the win. The Eagles ended the season with a 27-3 record. "It's easy to get down and lose your focus after you drop that first game (quarterfinals), but these guys came back and won their last two," Patrick said. "Not many teams get to end the season with a win." Zakharyuk connected on more than half his shots to finish with a game-high 21 points. He was named to the all-tournament, second team after averaging 16.7 points per game over the weekend. "He read the defense well and got in for several layups, and also knocked down a couple 3s," Patrick said. The Huskies have a lineup that feature four players 6-foot-3 or taller. Damascus responded to that challenge by packing the paint and denying entry passes. "They are so big across the board, we had to go to a compact zone and that proved to do the trick," Patrick said. "We were up two at the half, and I felt like the defense was doing its job." Sherman's main threat, senior Keenan Coles, was limited to seven shot attempts. Damascus point guard Johnny Shields scored 14 points and went 7-for-8 (.875) at the line, hitting a pair that sent the Eagles into halftime with a 29-27 lead. "Johnny hit some key shots and handled their pressure well," Patrick said. "As much as he had the ball in his hands, he ended the night with only one turnover." Nixyaawii defeated Trinity Lutheran 59-42 in the 1A championship game. 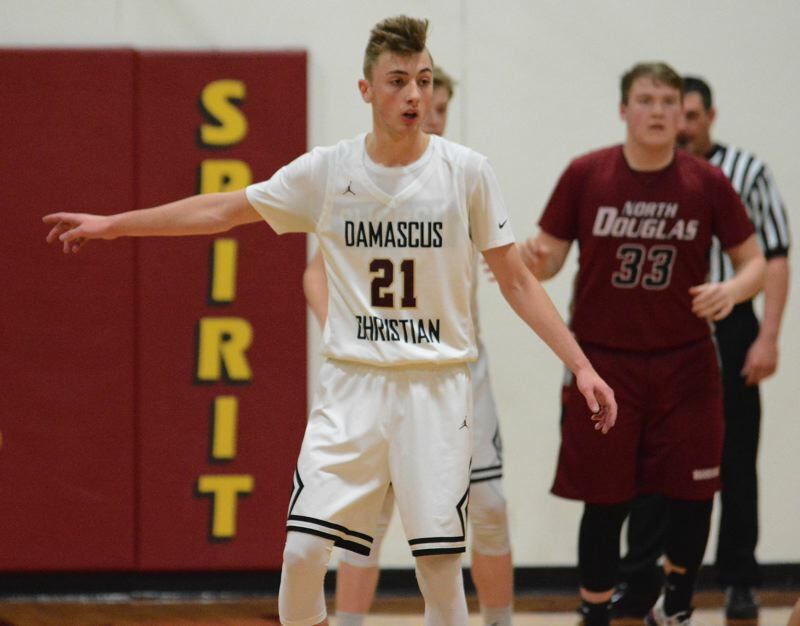 The Damascus Christian boys basketball team extended its season a few more days with a 65-52 win over Triad in Thursday's consolation game. After falling to Days Creek in the late game the night before, Damascus had a quick turnaround to return to the gym for the next morning's consolation round. "We did our best to remind them how far they've come," Damascus coach Brad Patrick said. "Once they stepped onto the court and the ball went into the air, the energy was there and they played with a lot of enthusiasm." The teams found themselves deadlocked at 42 heading into the fourth quarter. The final eight minutes belonged to the Eagles. Spencer Powers and Sam Titchenal each knocked down 3-pointers to give Damascus a lead it would not surrender. Titchenal knocked down three long balls in the game. "When he sets his feet and strokes the ball, he's a really good shooter," Patrick said. "I just had the conversation with him the night before to not think about it, but to just shoot if he's open." That prompted Triad to foul heavily down the stretch, sending Damascus to the free-throw line 10 times in the quarter. 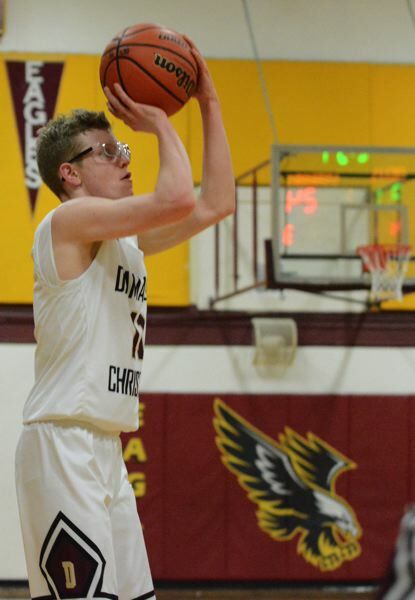 The Eagles hit 15-of-20 (.750) at the line, led by Jason Budey, who sank 5 of his 6 attempts. Damascus saw five players score in double figured, led by Jacob Zakharyuk with 15 points. "The kids were hitting their outside shots, and that forced Triad's defense to come out and made it easier for us to find paths to the basket," Patrick said. Our 1A state tournament coverage is slated for our Tuesday, March 5, print edition.